I had such fun altering my first altoid tin, so when a friend from church gave me this teeny one, I just had to do something similar. This is the before shot. 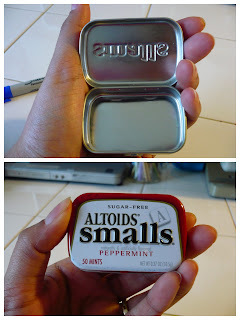 It's pretty much the same as any other altoid tin, but about 50% of the size. Cuuute! I have looked for these at Walmart, but they barely even stock the regular altoids, so I think I'd have to look at some smaller markets. Here is what it looked like after! To start, I placed the tin flat on a piece of felt, then traced around it with a sharpie. Now, you can bead and emroider it before you cut it out, or after. I did it after, so I could see exactly where everything ends up. It's hard to gauge it not cut out, because the front side that will show does not have the sharpie outline. Next, for the edge, I measured the circumference of the lid and cut a strip of felt to wrap around the edge. I did the same for the bottom. Then I pretty much just used hot glue to attach the felt to the outside of the tin. If you're planning on doing this, be sure you have the tin OPEN when you are gluing the bottom edges. The first time I didn't, and about glued the dang thing shut. It took some elbow grease and a box cutter, but I finally got it open. Learned my lesson. Okay, so if your tin won't close, use embroidery scizzors or any other tiny scizzors you have to trim the felt or glue blobs out of the way until the box shuts. Here is the inside! Unfortunately, I forgot to trace the tin onto the lining paper before I put the felt on, so I had to eye-ball and cut the paper. The fit could be better, but I'm not worried about it. Glue it in, add a sticker and stamp a word, and voila! Here's a detail shot of the emroidery/applique/beading. Cute huh??! Ki! I loooooove it! So much!